I thought I knew every pest in our woods and on the trail to Great Falls National Park, and had been bitten by all of them, but I have never encountered chiggers. Not in our woods, not on hikes to and in Great Falls National Park, not in Shenandoah. I have always thought of them as denizens of the deeper South. However, today the arborist who is taking down a large dead tree in our woods said he been badly bitten by chiggers yesterday. He said it was worse than the worst case of poison ivy. 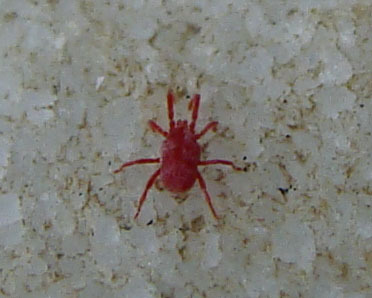 I looked up chiggers, and saw that they are in Northern Virginia. See Chigger Map of the United States. If so, they have been keeping a low profile in Great Falls. Are chiggers having a good year here because we have had enormous amounts of rain this spring and summer? Or are they more numerous because they are moving north? If masses of chiggers have moved permanently into the northern Virginia woods, how can I protect myself against them? I always wear long pants and long sleeves anyway; do I need to do more? I've had them a few times in the Upper Midwest as far back as approximately 35 years ago. They thrive in warm and moist conditions, therefore I'd think that having abundant rainfall would be a more likely cause for encountering them more often this year. Wearing long pants, tucked into long socks, and long sleeves will help but they can still crawl on your cloths until they find a bare patch of skin. If sitting or laying down in grasss, placing a blanket down first will help put a barrier between you and the pests. Insect repellent that has DEET in it or clothing treated with permetherin are also preventative options. Oils made from citronella, tea tree, jojoba, geranium, or lemon grass may also help. Interestingly, chiggers are actually an arachnids. They may also be called red bugs, mower's mites, harvest mites, harvest bugs, or harvest lice (hence the use of permetherin as a preventive measure as it's also used on head lice). Being a hunter in the south, there are times of the year where you can't avoid them without proper precaution. Some swear by a tablespoon of apple cider vinegar a day, which I do. I also spray the openings to my clothing with permethrin (sawyer brand). Permethrin will last on clothing through several washes and can be applied well in advance. Not the answer you're looking for? Browse other questions tagged united-states bugs or ask your own question. Are DEET-based insect repellents effective against fleas? Are any natural insect repellents effective against fleas?